Crash landing in Roswell, and our first RVillage encounter (finally!). Since leaving Odessa we have pushed forward pretty hard: two days without water hook ups in Balmorhea sledding the sand dunes, one day drycamped in the Guadalupe Mountains to hike the Devil’s Hall trail, and a half day parked in the visitor center lot in Carlsbad for cavern hiking. Simply put, we were tired and needed to stop for preferably three days of recharge, in every respect: we needed full hook ups to get our batteries, water tanks, and black water tank charged, topped off, and emptied, respectively. We were way behind on laundry and needed to catch up on this blog as well, but on a more basic level, we just wanted to settle for a couple of days after a very fun but hectic schedule. While we normally prefer nature to cities and towns, if it is a particularly interesting “people place” then we can certainly be lured in. 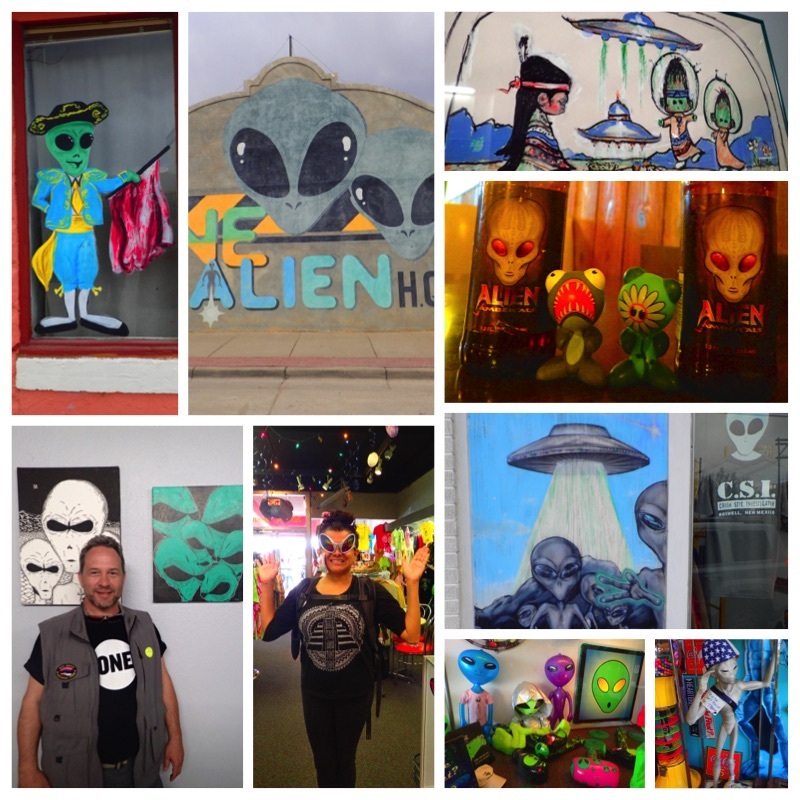 Since our next major destination was generally north-west, and the famous town of Roswell was only 90 miles or so north, it fit the bill perfectly. We checked the RV reviews and our favorite bloggers for park recommendations. If we possessed a tow vehicle we likely would have opted for one of the state parks on the outskirts of town, but lacking a tow we needed something close to the action within bicycle or walking distance. We called our tentative top choice, learned they were completely full, then called Trailer Village RV Park and got one of their last available openings. 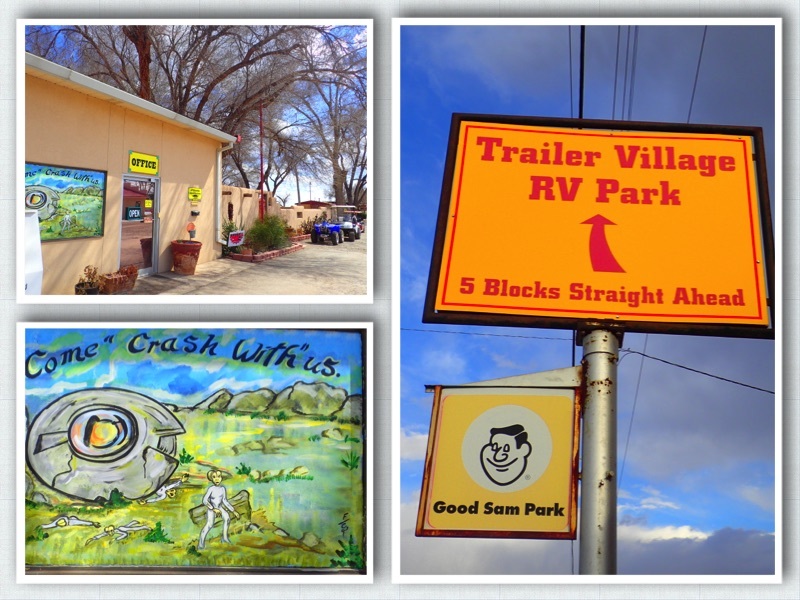 The park is clean, well maintained, nicely decorated and landscaped (allowing for the general browness of New mexico in winter) fully equipped for 50 amp service, has inclusively priced cable and WiFi (very good by RV park standards), with coin laundry rooms available. The no-nonsense co-owner, Debbie, checked us in, gave us the run down on the park, secured our 10% military discount (also honored for Good Sam members, must pay cash to receive this discount) and got us situated in short order. After discussions with several of the longer term park residents, we feel we lucked in to the right park. One of the other options has theft and security issues, and our other top choice was described as an empty lot behind someone’s house, regardless of how good their customer service reviews are. Besides, Trailer Village RV Park is the closest to downtown Roswell: 1.4 miles. Bottom line: if heading to Roswell, don’t let the somewhat typical and uninspired name fool you, this is the best bet for a full hook up park in town. Best of all, Trailer Village had three other rigs from RVillage.com present, our first ever encounter with people for that group after several near misses in Florida. RVillage is sort of a Facebook for RVers, but without the drama and predatory data mining. You register, check in to campgrounds, see who else is present, send them a message to plan a get together, etc. Best of all, when headed for a destination you can see who is already there and ask questions in advance. Thus we met Janet and Randy, Janice and John, and Mike. We got together for drinks and fantastic appetizers (thanks Mike, that coconut-pineapple-habanero jam was indescribable) which, under the influence of four bottles of wine, morphed into a full meal when Randy pulled out what I can only describe as the least healthy yet utterly delicious thing we have had in months: a pork loin inside a hollowed out baguette, with the whole thing wrapped in bacon. He cooked it on his Green Egg, and in tandem with my step dad’s strong recommendation, has us pretty much convinced that we need to get one of the smaller versions of this remarkable device. There was also this nearby town with a UFO fetish. We spend most of our second day in the heart of UFO mania. Pretty much every small business and even many of the chains push the alien thing hard in their street front advertising. It makes for an entertaining photo opportunity from nearly every corner. 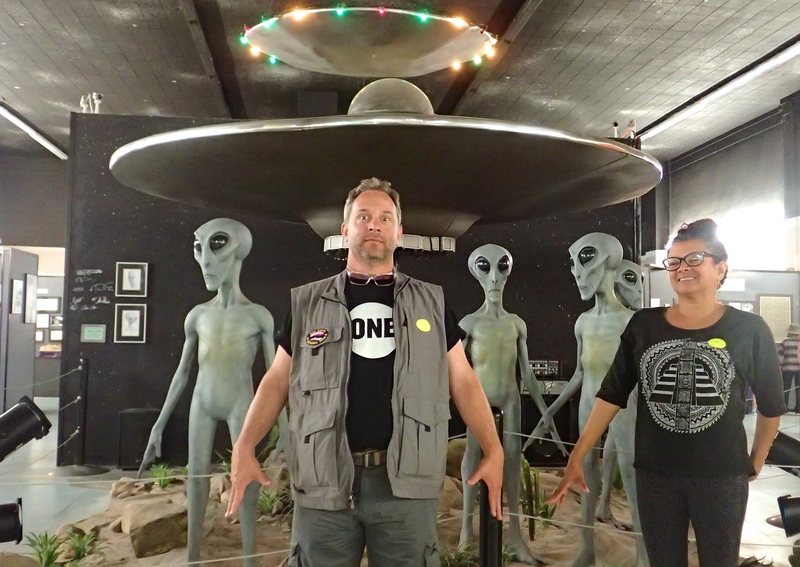 We got so wrapped up in it that we nearly missed our opportunity to visit the International UFO Museum. Because we arrived only half an hour before closing they let us in for half price ($2.50 vice $5 each). Yes, I’m deeply skeptical, but it was a fun and interesting to tour. My only criticism is that they need to update the displays; some of them appear to have stagnated in 1975 or so. Three days is sort of the sweet spot for us in terms of length of stay at parks, though as many longer term full time RVers mention, everyone tends to slow down their pace as time goes on and you get beyond the “OMG I must see everything right now” early phase. Next year a week my be the prefered stop length. But after three days in Roswell we were eager to get back on the road towards the Petrified Forest, Sedona, and Grand Canyon. One of these things is not like the others, one of these things, doesn’t belong. We share your sentiment on the RVillage experience. My wife Toni and I have been on the road fulltime since 9/2014 and have been on RVillage from about when it started. While our early travels had us in “no RVers land” we are now around many others. We have have had some near misses, but have yet to have a meetup with other RVillagers. We VERY MUCH look forward to the day it finally happens for us!! Kurt we were beginning to wonder if we would never meet any unless we attended a big rally. After nearly 30 different spots, Roswell was our first connect. I think being in the big winter areas, South Florida and the South West, really increases the chances. Take care and thanks for reading and commenting. 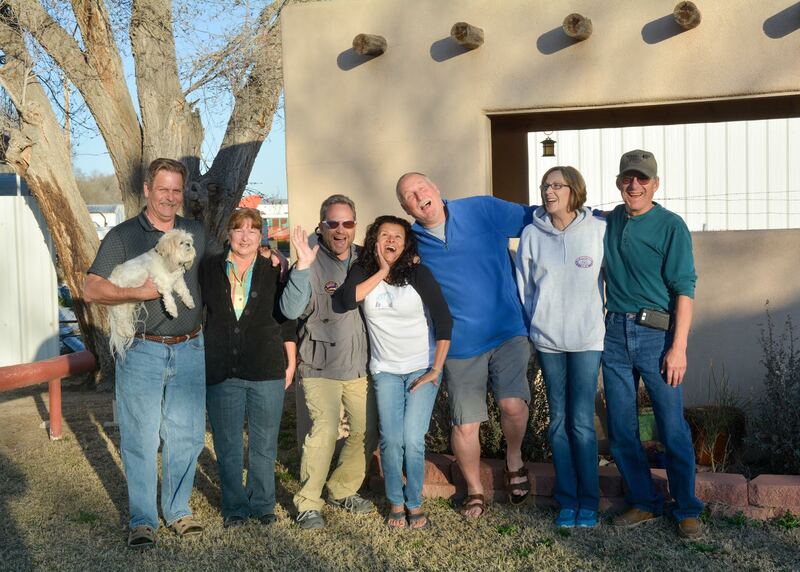 How cool to encounter you guys… we met up with JenEricRamblings last night in New Mexico, and they mentioned they had been following your tail for a couple weeks.. and that you also travel in a 4106! Your names are a bit familiar, so I’m sure we’ve actually run across each other before. We’re actually working our way eastward.. and had started mapping out a route similar to what you guys just took westward. Enjoy Arizona… we just spent a couple months there, and had an amazing time! Anyway, have you added to Instagram, FB and on our blogroll.. so will keep in touch. We just love seeing other younger folks like us keeping these old buses on the road! Thanks for the comment and blogroll addition. Yes, we exchanged emails right around the time we bought The Big Kahuna. You sort of brought us down from our giddiness with a reality check, proven accurate during the last year, about the challenge of keeping one of these rigs running. Sorry we missed you in AZ or NM! Since we have followed you for years, well before we got the bus, we were hoping to get a photo-op with our rig and Zephyr. After our one year circuit of the country we will winter in Florida, so perhaps we will see you there? Perhaps by then we will have made a decision on how much of your inverter/battery/solar panel set up to emulate. Yes it was fun. Can’t say we will be back, but glad we went this year. Thanks Valerie, we look forward to meeting any RVillagers, and especially other travel bloggers.